New Low Prices! Now anyone can afford to try buy our full-capability professional version. ProSurf 3($395), ProBasic 3($195), and ProChine 3($95)! Student Price For ProSurf 3 is Just $195! School Pricing: $250 One-time fee for a lab license. This picture shows a vessel balanced (displacement and lcg) on a trochoid wave pattern. The program balances the boat on the waves and then allows you to create a surface that defines the waves being used. You can even balance a heeled boat on a wave pattern. You can also display the heeled lines of the boat. ProSurf 3 is a full capability trimmed NURB surface modeling package. It even includes capabilities not found in any program at any price. For example, imagine being able to attach a NURB curve to a NURB surface in one step, marking it as a trimming curve, and then dynamically dragging the curve and watching the trimmed surface update in front of your eyes! You can also grab any point on the underlying NURB surface and edit its shape. No un-trim and re-trim is necessary. Add rendering, extrusions, skinning, shelling, reverse engineering, 3D bonded, editable solids and you will see the direction we are heading. All of this on top of our unique use of edit points ON the NURB curves and surfaces and all of our detailed shaping and fairing tools! This new version of ProSurf (version 3) also includes more calculations such as hull resistance (Holtrop, Transom Hull Displacement Mode, Delft3 Series, and Kaper). We believe that ProSurf 3 is now the most powerful and easiest to use boat/ship design and fairing program on the market. Don't take our word for it. Go to the Products Section and download a usage limited full working version. ProSurf 3 is also the least expensive full-capability boat/ship design program at $395! It costs less than other programs' yearly maintenance fees. How can we do this? We sell many copies of our general purpose version of ProSurf 3, called Pilot3D (www.pilot3d.com). Pilot3D is the same as ProSurf 3, but without the boat/ship functions, like hydrostatics, stability, and resistance calculations. New Wave Systems, Inc. announces the availability of a new program for on-board ship trim, stability, and strength calculations. This program replaces the manual methods for Stability Booklet calculations. 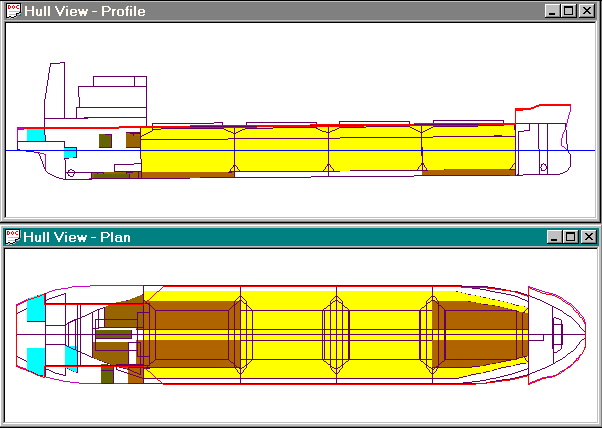 This Windows-based program displays the ship in three views, showing all of the ship's compartments and how much each one is filled. The compartments are listed in a spreadsheet-like window and the ship captain simply enters the soundings, ullages, volumes, or %Full values for each compartment. The program will automatically recalculate the new weight distribution curve and then find the final sink-trim-heel condition of the vessel. The vessel will be displayed in this trim condition and all hydrostatics, stability, and strength results will be displayed. Each "Departure" and "Arrival" condition can be saved for later use. The program can be used for any type of vessel and is based on the true geometry of the hull and compartments. It does not simply interpolate the data in the ship's Stability Book. The program will even calculate the true shift in CG (Center of Gravity) for a shift in liquid cargo due to the trim and heel of the vessel. The program has been installed on several ships and has gone through the Lloyds approval process.